Good e-Learning provide award-winning training for the biggest standards in Enterprise Architecture (EA). Gain a globally recognized qualification with our fully accredited courses. Good e-Learning cover the full suite of ITIL accreditations including the new ITIL 4 framework. Help boost the efficiency of your organization or take the next step in your career. Good e-Learning offer a number of courses for the biggest standards in project, portfolio and programme management. De-facto requirements for organizations of any size and type. Good e-Learning offer both awareness and certification courses for IT4IT, a vendor-neutral Reference Architecture for managing the business of IT. Accredited by The Open Group. Good e-Learning offer a number of courses perfect for companies or individuals looking to gain a recognized certification in IT Governance or an introduction to the GDPR.  What is the General Data Protection Regulation? Good e-Learning offer a range of fully accredited certification courses for DevOps focussing on the most modern competencies required by organizations adopting DevOps. Good e-Learning offer a leading training course for BPMN 2.0, the de-facto notation standard for Business Process Modeling. Learn and apply your knowledge in a way that suits you. Good e-Learning offer a number of Lean, Six Sigma and ISO courses enabling students to manage and support a Lean Enterprise approach in any organization. Availability management has a close relationship with the operational processes of incident and problem management. It shares goals of service improvement and stability with problem management, and with incident management, it has an operational responsibility to identify where outages can be reduced. This is done with the appropriate measurement of the service, in terms of the incident lifecycle. In this interactive guide, we explore the expanded incident lifecycle (one incident followed by another) to understand the metrics required to manage service outage more effectively. 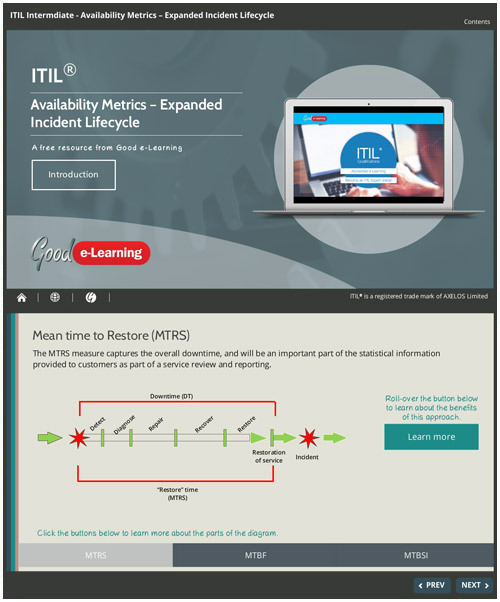 Click below to learn about ITIL’s Availability Metrics and you’ll also get instant access to over 460+ Business and IT learning resources!